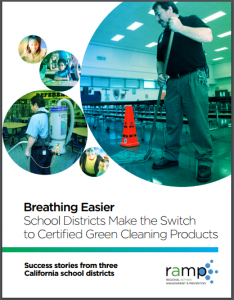 RAMP’s report shows how schools are finding ways to create healthier classrooms and save money by switching to “green” cleaning products. On World Asthma Day (May 5, 2009), RAMP released Breathing Easier: School Districts Make the Switch to Certified Green Cleaning Products, a report highlighting the experience of three school districts in California that have transitioned to certified green cleaning products. Each story is unique but all have the same outcome: the replacement of traditional cleaning products with certified green cleaning products which school maintenance officials, superintendents, teachers, parents and students attribute to a healthier indoor environment and improved conditions for teaching and learning. One in six children in California has been diagnosed with asthma. It is the most common chronic disease among school-aged children, and is the leading cause of school absences due to chronic illness nationwide. Additionally, work-related asthma is high for educational service workers, including teachers, instructional aides, and janitors. These respiratory issues are, in part, related to the air we breathe, both outdoors and indoors. Heeding warnings from the California Air Resources Board (CARB), who found significant indoor air quality concerns in California’s schools, many schools are taking action to reduce the burden of asthma on their campuses. Ironically, CARB’s study found that one part of the problem stems from the very products used to keep schools clean. Other studies confirm that occupational and home use of conventional cleaning products is associated with increased risk of asthma. Certified green cleaning products, on the other hand, are prohibited from containing asthmagens (agents known to cause asthma) and have limits on some asthma triggers (agents that exacerbate existing asthma), providing schools with a healthier alternative. As districts across the state become more familiar with the example set by early adopters, RAMP hopes to see more districts follow their lead and take this simple, cost effective step toward creating healthier school environments. We at RAMP encourage you share this report with advocates and decision makers. You can download a PDF copy of the report here or request copies be sent to you at info@rampasthma.org.